Colour is hugely important to all of us. We mostly take it for granted, like the air we breathe. Our response to it is an integral part of our daily lives and in each individual it is influenced by a unique life experience. What colours might the deuteranope eye be able to generate? A surprisingly large proportion of the more celebrated Impressionist, Post-Impressionist and early Modernist painters were short-sighted. Moreover, since the rod receptors, which he was now forced to use, absorb light of a different wavelength to the cone receptors which dominate normal colour vision, his later paintings contain a choice of colours that strike modern eyes as unusual and exciting. “You can’t possibly be an artist with colour vision like that!“; said Francis Pratt of The Painting School of Montmiral as his first reaction after testing Gordon Frickers colour vision. Deuteranope: clearly the difference in extreme cases particularly when mixed with other ‘eye’ issues is spectacular and raises the questions what colours the deuteranope eye might be able to generate, how does that affect the individual and society in general. Colour (color) blind is an emotive statement; yet, these two words are contradicted by the facts for Gordon Frickers and a very few other artists. Deuteranopes can distinguish not only greens and violets but also a whole range of other colours. From the way Gordon and others describe their colour experience, it is clear that they see green and violet in a different way to the majority of us. About one in eight men and many women are born with colour vision that differs from that of the majority. These people have only two cone receptors in their retinas as opposed to the more widespread three. To call their vision defective is misleading since studies show that two cone-receptor eyes pre-dated three cone receptor ones by a very long period of time. The latter only appeared when, in prehistoric times, our ancestors left the savannah for the forests where they needed to be able to distinguish red, orange and yellow fruit from the green leaves in which they nestled. In some respects this was an important gain, but not in others. To this day the possessors of two cone-type eyes have substantial advantages in certain situations. This has long been known to be true for those who live an outdoor life amongst animals whose camouflage hides them from people with three cone-type eyes. This different sensitivity to colour proved to be of great use in the Second World War when people with two cone-type eyes were taken up in aeroplanes to detect camouflaged targets. For those interested in the work of artists with only two cone-types in their eyes, all this leaves three questions. What is their experience of colour? In what ways does this affect the paintings they produce? Do these offer any special colour-related excitements to spectators with three cone-type vision? These questions are of fundamental interest for Gordon Frickers, who is amongst those with two cone-type eyes. Since his earliest beginnings as an artist he has been faced with a choice. Either he must learn to hide the special nature of his colour vision, or he could explore the opportunities it opened up for him. In his early marine paintings he showed how able he can be at deception. Latterly, he has opted to give more time to investigating the advantages of painting as he sees. This has enabled him to paint in a much more direct way and has proved to be a liberation and a joy. But, what has this meant for others? In addition to painting in new ways, Gordon has been trying to find out as much as possible about his special vision. In this he has been helped by conversations with me. I was formerly a Senior Research Fellow in the Department of Psychology at the University of Stirling, in Scotland. where I made a study of how artist’s use their eyes when at work. One of the main focusses concerned the nature of colour vision. After leaving Stirling I founded the Painting School of Montmiral, in France. Over the years a fair number of gifted artists with anomalous colour vision have attended my courses, with the result that I have for a long had a special interest in their problems and opportunities. According to the Ishihara colour blindness test, Gordon is a “deuteranope”, which means that although possessing red and blue cone receptors, he lacks green ones. To get some idea of what this means in practice it is necessary to realise that, according to classical colour theory, the colours we see are created on the basis of the relative degree of stimulation of the different colour-sensitive receptors by the light coming into they eye. 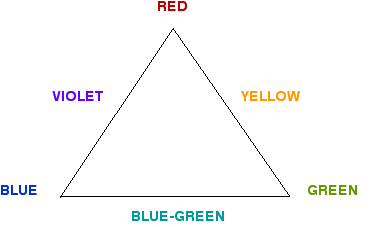 The potential for colour vision which this offers a three cone-type eye is often illustrated by means of a colour triangle. FIGURE 1 : COLOUR TRIANGLE SHOWING HYPOTHETICAL MIXTURES BETWEEN THREE CONE-TYPES IN THE RETINA OF THE EYE. Figure 1 shows how inputs to the eyes of people with three cone types (red, green and blue) can create mixtures. The red and blue generate violets, the blue and green create blue-greens and the red and green produce yellows. Compare this with the situation for a red-blue deuteranopes like Gordon, as illustrated in Figure 2. FIGURE 2 : COLOUR-LINE SHOWING HYPOTHETICAL MIXTURES BETWEEN TWO CONE-TYPES IN THE RETINA OF THE EYE. Clearly the difference is spectacular and raises the question as to what colours the deuteranope eye might be able to generate. If matters were the same as for people with three cone-type eyes, even at its most optimistic, the answer would be that the only three possibilities for the deuteranopes would be reds, blues and violets. Actually, for reasons explained below relating to opponent-colour cells, they would actually only see reds, blues and neutral. However this is certainly not the case. To make clear why, it is necessary to explain what happens to the light-stimulated information after it leaves the cone receptors of a three cone-type visual system. This is illustrated in Figure 3, where the information from the red and green receptor cells can either go up the neural network separately or be directed independently to other cells where their information is combined. This cell then acts as a fourth (yellow) input to the system. FIGURE 3 : RED AND GREEN CONE-TYPE RECEPTOR CELLS INTERACT TO PRODUCE YELLOW. These four inputs are then fed up the system into two types of opponent-colour cells. Thus red is opposed to green and blue to yellow. This changes the situation dramatically, as illustrated in Figure 4, which illustrates diagrammatically that when two signals of equal strength arrive at an opponent-colour cell the outcome is that they are cancelled out to give a neutral (i.e. achromatic) response. It also shows how the colours can still be mixed between the different cell types to create all the colours or the spectrum. FIGURE 4 (1) A COLOUR-SQUARE SHOWING MIXTURES BETWEEN TWO OPPONENT COLOUR CELLS AND (2) A COLOUR-LINE SHOWING MIXTURES BETWEEN RED AND BLUE OPPONENT COLOUR CELLS. Referring to this diagram, we are in a better position to discuss exactly what a visual system based on two cone-types can see. The first observation is that it certainly could not see both violet and green. The second point is that it might not be able to see either, since the evidence from Figure 4 suggests that what it would actually see is gradations between red and neutral and blue. Are we therefore to conclude that this is the range of colour experience open to Gordon Frickers and other people with two-cone vision? If we were to agree that he only has two types of colour receptor in his eyes the answer would be “yes”. Yet, this answer is contradicted by the facts, for deuteranopes can distinguish not only greens and violets but also a whole range of other colours. However, from the way Gordon and others describe their colour experience, it is clear that they see green and violet in a different way to the majority of us. For example, when Gordon is looking at these colours he senses an ambiguity and vagueness. It is as if he sees them through an achromatic veil. It also takes him longer to analyse what he is seeing and despite the intensity of his interest, he makes his analysis with a degree of uncertainty. How can we explain this? The only way is to posit the existence of a fourth receptor-type with a different wave-length sensitivity. Fortunately for Gordon and other people with two cone-type receptors in their eyes, there is indeed another receptor-type in the retina. Due to their different shape these are known as the “rod receptors”. In many accounts of how the eye works they are associated only with brightness discrimination. However, they do have a light sensitivity-function which peaks between those of the blue and the green cone receptors. The great difference between them and the cone receptors is that they are activated by lower levels of illumination. This is why at dusk, when the less sensitive cone receptors are less active, we all see violet flowers as being bluer. Another situation in which the rod receptors are active for three cone-type eyes is when we look at large expanses of uniform colour. This is because the cone receptors are concentrated in the middle of the retina, leaving the rod receptors to deal with the peripheries. Except in such special circumstances, it would seem that for people with three cone-receptor types, the rod receptors have little effect on their visual experience. However for Gordon and those with eyes like him, they are being used all the time. In effect they have three colour receptor-types (red cones, blue cones and blue-green rods). Over the years Gordon has learnt how to use his special eyes in the most efficient way. One of the things he has discovered is that seeing the maximum range of colours is much easier when the levels of illumination are high as they are outdoors in the bright sunshine where he loves to paint. There is a very interesting reason for this which follows from the fact that the eye is constructed in a way that surprises many people. 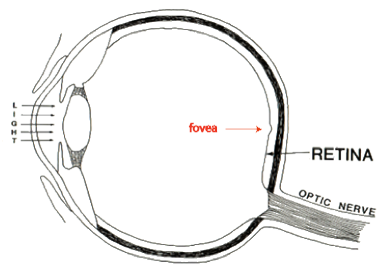 Thus, in all parts of the retina, except in the very central part known as the fovea (the tiny dip in Figure 4), where the vast majority of the less light-sensitive cone receptors (and relatively few rod receptors) are to be found, the light entering the eye has to traverse light-absorbing networks of blood vessels and neural processes (Figure 5). Only after doing so, does it reach the level of the receptors (which, contrary to most people’s expectations, face away from the light). Due to the filtering effect of blood vessels and neural processes, much light is absorbed before it can activate them. This explains lots of things. Why the cone-receptors are overwhelmingly situated in the fovea, where their relative lack of sensitivity allows them to operate when exposed to the unfiltered and, therefore, more intense light. Why few cone-receptors are situated in the peripheries of the retina, where the filtered light is unlikely to be strong enough to activate them. Why the rod-receptors are overwhelmingly in the peripheries of the retina, where the filters provides by blood vessels and neural processes reduce the intensity of the light that reaches them. 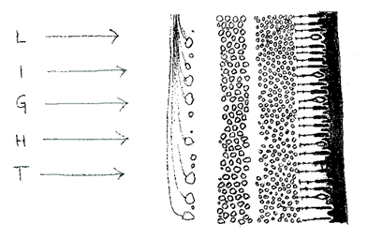 Why the cone-receptors can operate in full daylight when without the filters the light reaching them would normally be too intense for them. This is why, Gordon needs plenty of light if he wants to use them to the best effect. What does all this mean for his visual experience? Only other people with two cone-type visual systems can really know what this colour experience is like. All we can say for certain is that it must be very different from three cone-type vision. But if we listen carefully to what Gordon and others like him tell us, we may suspect that it has dimensions of excitement that are not available to the majority of us. It appear that his colour world is much more dynamic. This may be because three cone-type systems have developed the capacity to produce colour constancy which means that people with them see surfaces with the same pigmentation as the same colour even when they are illuminated by different wavelengths of light. To achieve this their visual systems have to overlook the light that is reflected directly from all surfaces. If the lack of the third cone-type receptor means that Gordon’s visual system does not achieve colour constancy, this could well explain the excitements he describes. The basic colours of surfaces would be much more volatile. Gordon would see patterns of light playing across them that would be invisible to three cone-type eyes. Shadows would be much more colourful. Whether it is despite of or because of his special eyes Gordon, like other two cone-type receptors has a passionate love of colour. Since he decided to pursue this without worrying what people with three cone-type visual systems would think of the results, he has felt a sense of release. This has meant that his immediate feelings about what he is experiencing play a much larger part in his artistic production. Accordingly, his brushwork has loosened up and his paintings have a much more dynamic feel to them. From his own point of view, they have become much more alive and interesting as works of art. From the point of view of those of us who do not share the advantages he enjoys due to his special eyes, the colouring in his paintings is palpably different from anything we are likely to have seen before. The question we have to ask ourselves is whether this difference offers us something of value that we can appreciate. In other words, has Gordon’s different way of experiencing the visual world given his work something special for the rest of us, as did the visual problems of Degas and Monet mentioned at the beginning of this essay? This is for each individual to decide for himself or herself. However, what is clear is that his colours challenge and excite many people in much the same way as did the unexpected colour combinations of his illustrious predecessors.